Ben Affleck has delivered hit after hit from behind the camera with Gone Baby Gone, The Town, and Argo. In many ways Live by Night is the worst of the bunch, missing the mark especially compared to the rest of his films, but it’s not all that clear cut. Live by Night is a bit of a roller coaster, mixing in perhaps some of Affleck’s best directing work with some of his worst. Overall it balances out to a pretty ho-hum film, which is disappointing given how much I love his previous work. 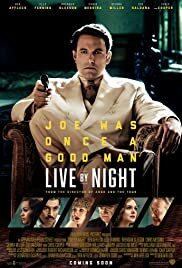 Live by Night is adapated by the novel of the same name by Dennis Lehane, who also wrote the source material for Affleck’s other films (minus Argo). Either this novel isn’t as good as Lehane’s others, or Affleck did a bad job at adapting it, the key result is that the film version feels stilted. The beginning, middle, and end are disjointed and are connected by the loosest of threads. Toss in Joe Coughlin’s (Affleck) narration thoughout, Live by Night often comes across as merely a glorified audiobook with a visual component thrown in. The first act especially, which takes place in Boston, is perhaps the least put-together part of the film. A lot goes in in the thirty-or-so minutes we spend there. We start with Coughlin’s days in the military, his return to the U.S., robberies of small joints with his crew, mob connections, love story, police drama… the list goes on. It is simply too much packed in to not enough time. Much of it is important for later parts of the film, but it really does not tie in with the other two-thirds set down in Florida. We need most of this information, but we don’t need it jammed down our throats in a contained piece. Bring these pieces up through flashbacks or the like, sprinkle it in throughout the movie as it becomes relevant to the Coughlin-building empire in Florida. The Tampa/Ybor City time period of the film is hands-down the most entertaining and enticing. This is the quintessential Ben Affleck who won the Golden Globe and BAFTA for Best Director. Clear action, compelling characters, and a passion for the source material. Affleck’s attention to detail and research about a particular place, location, time-period, you name it — that’s the key to the success in Argo or The Town. Affleck cares and it shows. Unfortunately, for large swaths of Live by Night that’s either completely absent or it feels like he’s phoning it in. Give me a story that just shows Joe Coughlin at the top, corralling the rum-production in prohibition-era United States and morphing into a mob boss of his own despite being under the thumb of Maso Pescatore (Remo Girone), and I think you’ve got me 100% hooked. After the snooze-fest lull at the start of the film, my interest was piqued and Live by Night started on quite the film journey. But another unfortunate turn of events, Affleck couldn’t stop this roller coaster from going off the rails at the end either. Despite a wonderful, well-choreographed dramatic action scene at the end, Live by Night overstays its welcome and takes another downturn. It’s a return to the beginning of the film, which again, not really the best part of the film. Still, despite all the negatives here, Live by Night isn’t a complete disaster. Indeed there are many extraordinary parts, you just have to wade through a whole lot of junk to get there.